et la encore... on se croirait chez nous !!! faire clic droit sur les carré noir et cliquez sur "lire"
Merci pour ces images fantastiques ! 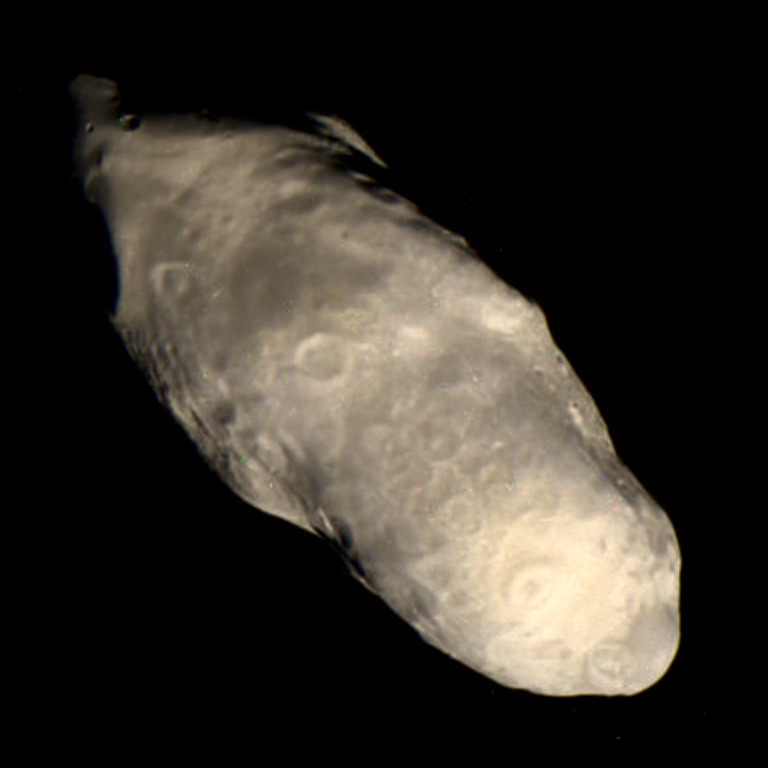 mimas 'étoile de la mort"
Le 15 février 2010, la sonde Cassini a surpris le passage apparent d’Épiméthée (138 km) devant Janus (194 km) ; animation ci-contre. Ces deux petits satellites de Saturne sont situés presque sur la même trajectoire, puisqu’ils se disputent des orbites distantes de seulement 50 km. Une particularité due au fait que les deux corps sont a priori les fragments d’un satellite plus gros. Actuellement, Janus circule sur l’orbite la plus interne. Il est en passe de rattraper Épiméthée. Ce faisant, il va freiner légèrement celui-ci, le faisant passer sur une orbite légèrement plus proche de Saturne. Par effet inverse, Janus va être accéléré et s’éloigner faiblement de la planète. Par ce mécanisme étonnant, les deux satellites s’échangent leur orbite tous les 4 ans environ. Un tel rapprochement entre les deux corps a déjà été observé en 2006. Cassini continues its extended tour of the Saturn system with the 18-day-long Rev131, the spacecraft's 132nd orbit around the Ringed Planet. Cassini begins Rev131 on May 8 at its farthest distance from Saturn, called apoapse. 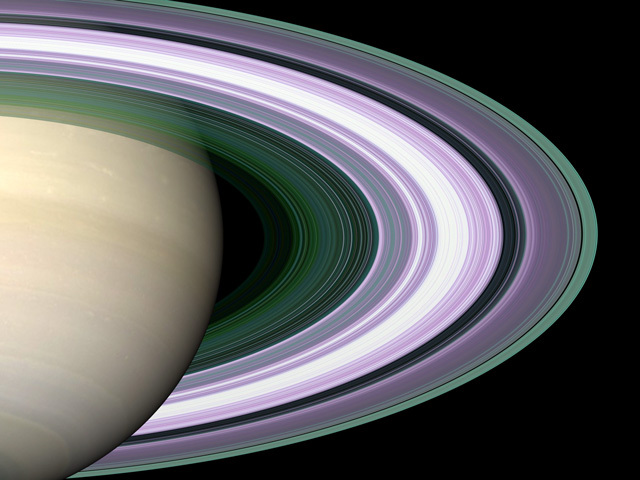 At this point, Cassini is 2.6 million kilometers (1.62 million miles) from Saturn's cloud tops. With Cassini still in an equatorial orbit, the spacecraft will perform the second of two encounters of Enceladus over the span of three weeks. 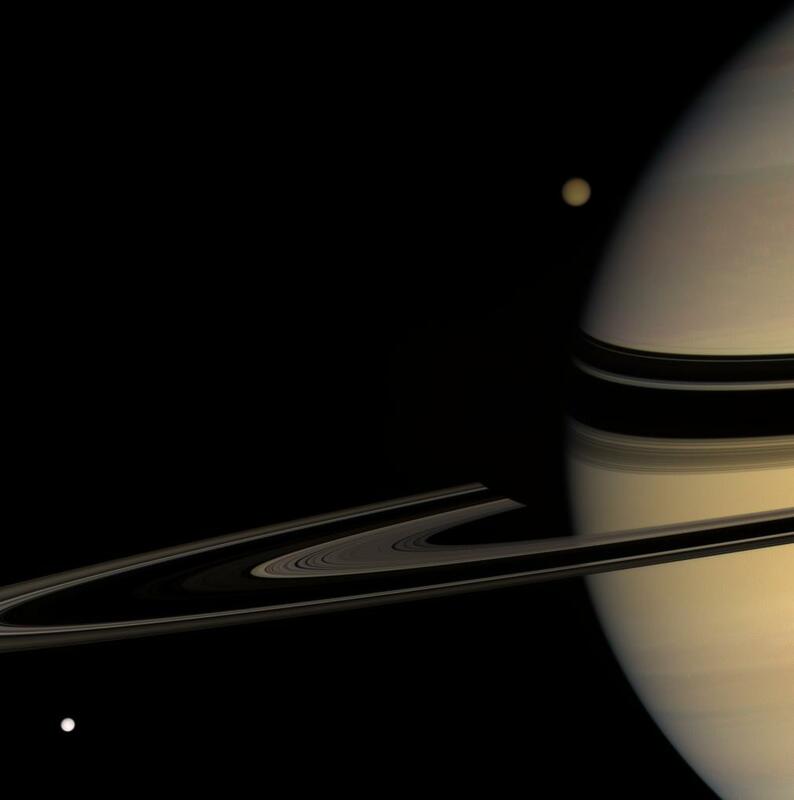 Cassini will also fly by Saturn's largest moon, Titan, for the 69th time. Cassini's ISS camera starts its observations for Rev131 two days after apoapse by imaging Titan's trailing hemisphere from a distance of 2.88 million kilometers (1.79 million miles). This observation is part of a series of images taken to monitor clouds in Titan's lower atmosphere. On May 11, Cassini will acquire calibration images for its wide-angle camera (WAC). The camera will image the star Alpha Virginis (Spica) first using its IR5 filter, then with a series of filters. These images are intended to check the photometric response of the WAC at the shortest possible exposure times. Between May 12 and 14, ISS will acquire three observations of Saturn's outer large icy satellite, Iapetus. These observations will be distant imaging opportunities with Cassini between 1.55 million and 1.90 million kilometers (0.96 million and 1.18 million miles) away from the moon. This sequence will focus on Iapetus' sub-Saturn hemisphere. 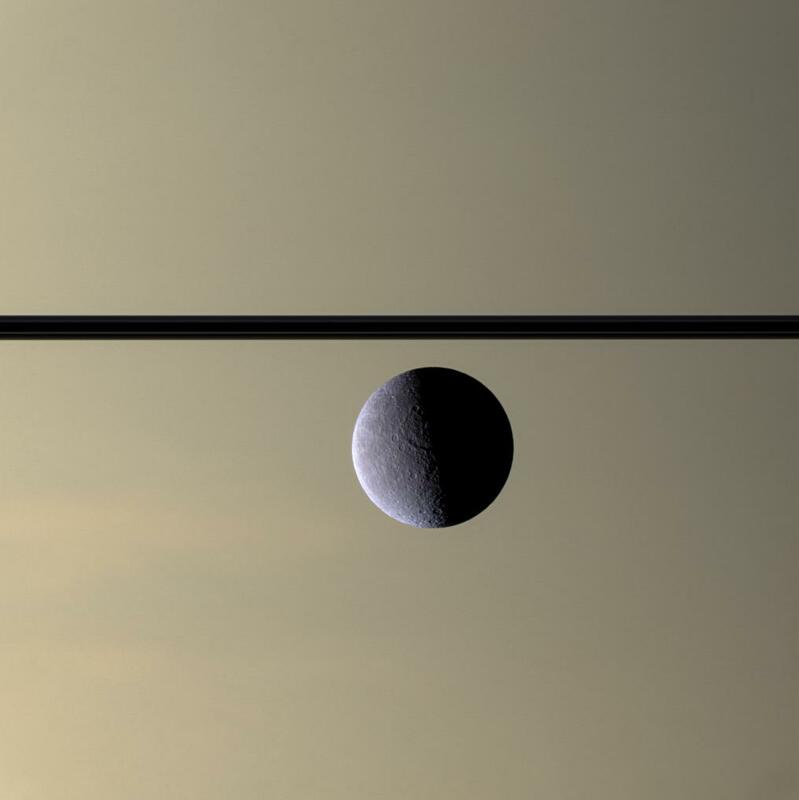 On May 17 and the early hours of May 18, Cassini will turn its cameras to Dione as ISS rides along with the Ultraviolet Imaging Spectrometer (UVIS) and the Composite Infrared Spectrometer (CIRS). 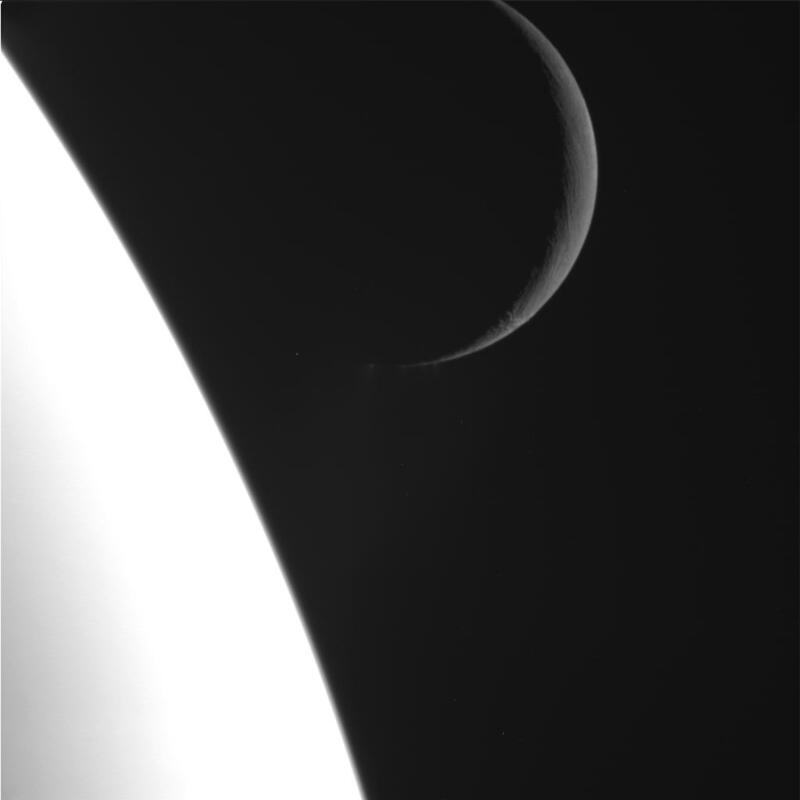 The first observation, riding along with CIRS, will focus on a crescent Dione. The camera team is interested in searching for possible cryovolcanic plumes emanating from Dione's fresh tectonic fractures. This observation will be acquired from a distance of 500,000 kilometers (310,000 miles). The second observation will be taken while CIRS measures the temperature of the moon's surface as it passes into the shadow of Saturn. 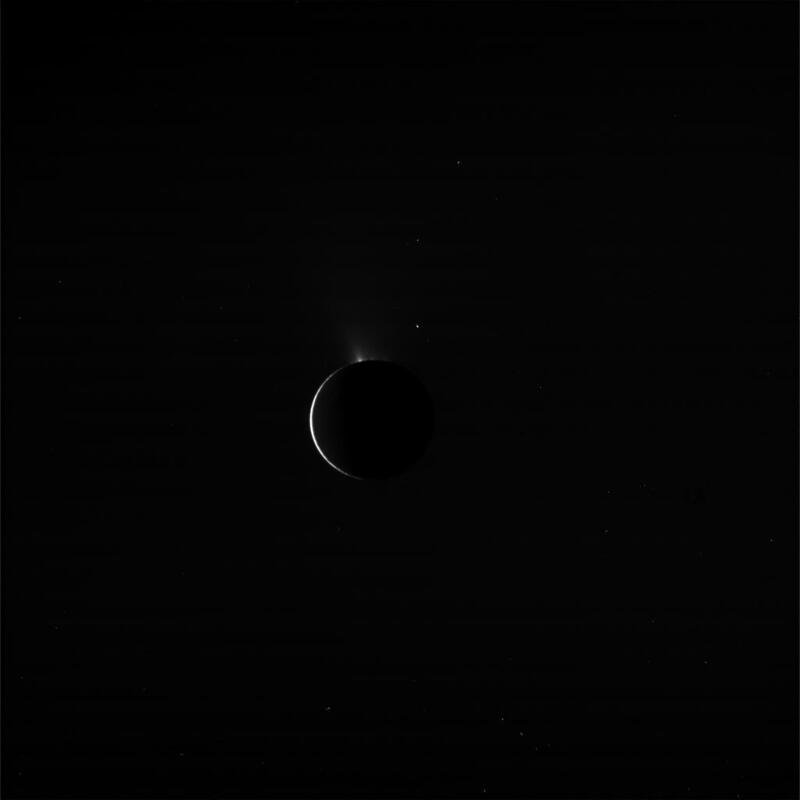 Late on May 17, Cassini also will take a series of distant images of Enceladus in order to gauge the level of plume activity over the moon's south polar region. These images will be taken from distances of 230,000 to 440,000 kilometers (143,000 to 273,000 miles) as Cassini closes in on the icy satellite. On May 18 at 08:31 UTC, Cassini will reach the periapse of Rev131, its closest point to Saturn in the orbit. At periapse, the spacecraft will be 150,000 kilometers (93,000 miles) above Saturn's cloud tops. A few hours before periapse, Cassini will fly by the icy moon Enceladus, passing 436 kilometers (271 miles) above the satellite's surface at 06:04 UTC. This is Cassini's 11th targeted encounter with Enceladus. Unlike the last flyby when Cassini's high-gain antenna was pointed at Earth for the entire encounter, precluding imaging and other remote sensing, this encounter is dedicated almost entirely to remote-sensing, though instruments like the Cosmic Dust Analyser (CDA) and the Ion and Neutral Mass Spectrometer (INMS) will be active during closest approach to detect plume particles. 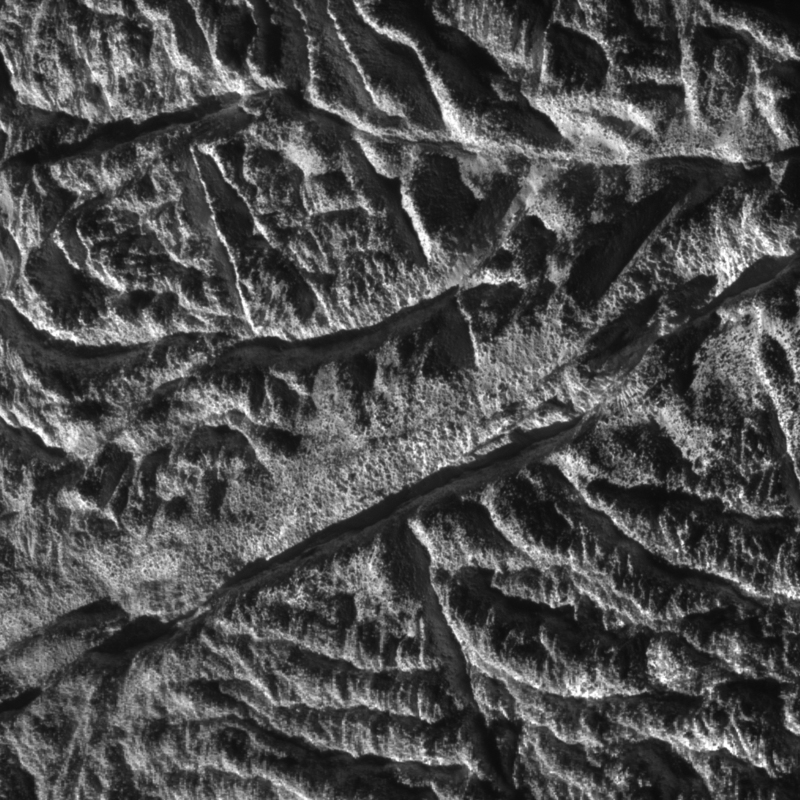 Cassini will approach Enceladus over its night side, allowing CIRS to measure the satellite's night time temperatures and for ISS to image the forward scattering particles of Enceladus' south polar plume. 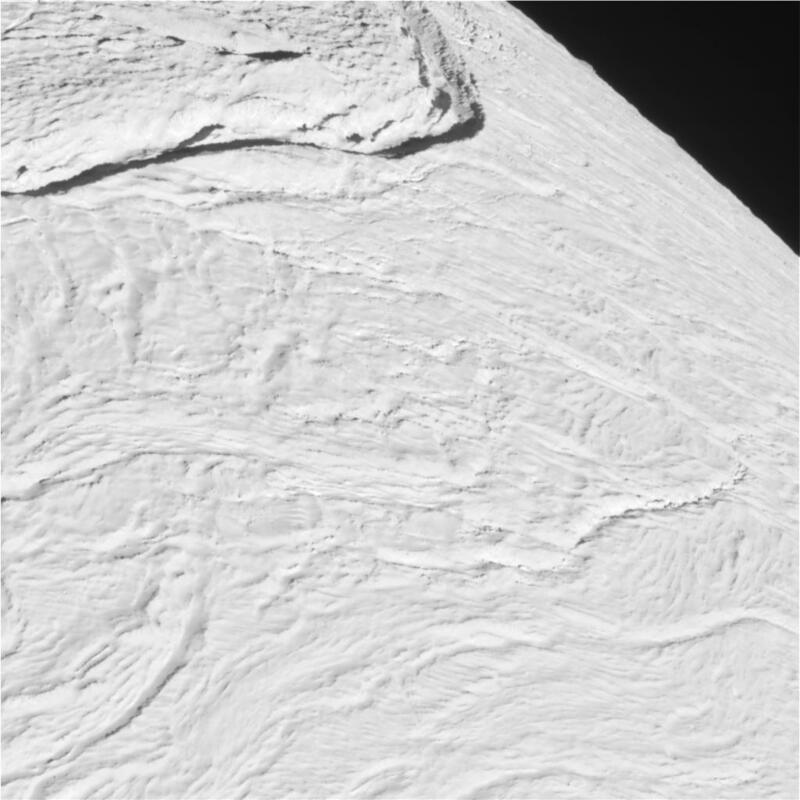 Shortly before closest approach, ISS will acquire six high-resolution images of Enceladus' south polar jets, similar to the spectacular sequence taken during Rev121. 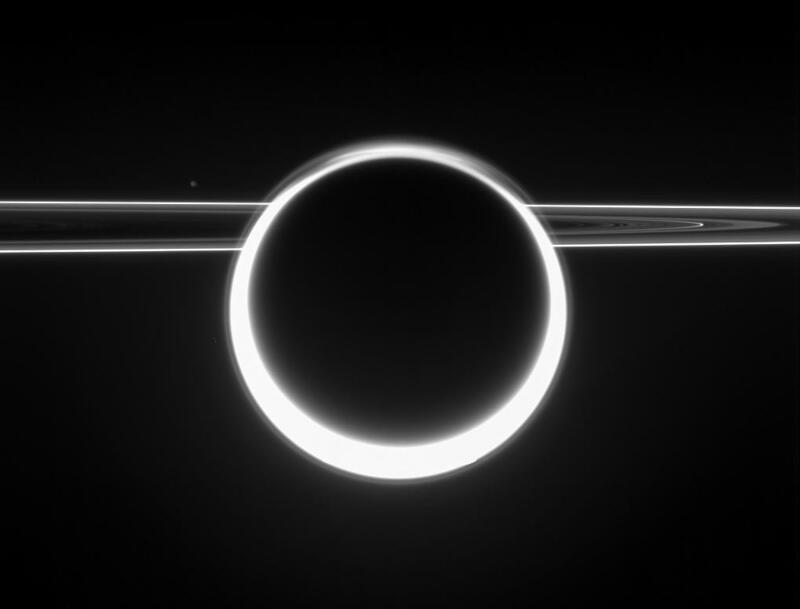 The last image of the observation will include a "Kodak moment" image opportunity as a crescent Titan and Saturn's rings pass through the field-of-view. Following closest approach, Cassini's ISS and Visual and Infrared Mapping Spectrometer (VIMS) will observe the sub-Saturn hemisphere of Enceladus. ISS will acquire two mosaics of the satellite during the outbound sequence. The first, ENCEL001, is a nine-frame mosaic that covers most of the leading hemisphere portion of the visible disk. This mosaic will have a resolution of 91 to 135 meters (298 to 443 feet) per pixel. 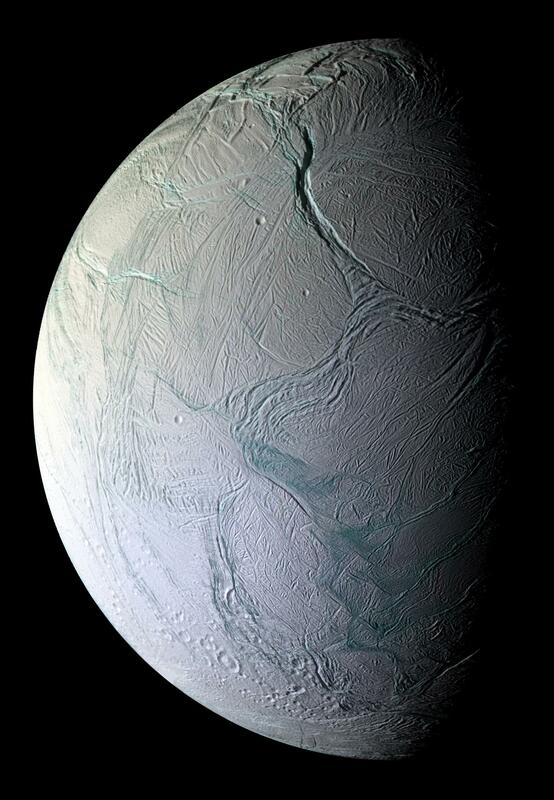 The second mosaic is a four-frame mosaic that covers all of the visible surface of Enceladus. ISS also will ride along with CIRS and VIMS sequences, taking a number of polarized green filter images with the CIRS observation that wraps up the encounter. Cassini encounters Titan on May 20 at 03:24 UTC for the 69th time. This is one of the last encounters of the first extended mission, which ends on July 1, with two more encounters to come in June. The close approach distance for the encounter (known as T68) is 1,400 kilometers (4,636 miles). This flyby will allow imaging of the anti-Saturn hemisphere of Titan outbound to the encounter. This encounter also will boost Cassini's orbital inclination, bringing it out of the ring plane for the first time since January. For much of the inbound and outbound segments of the encounter, the CIRS team will control spacecraft pointing, or be "prime." CIRS will focus on measuring the composition of Titan's atmosphere and measuring its temperature at different altitudes. ISS has a pair of prime observations on approach to Titan when only a crescent will be visible along with a ring of upper atmospheric hazes. These images will focus on characterizing changes in these hazes as spring progresses in the north. ISS also will ride along with CIRS's observations before and after closest approach in order to track clouds. When Cassini is closest to Titan and for a few hours afterward, RADAR will acquire a Synthetic Aperture Radar (SAR) swath across the southern leading hemisphere. The day after the encounter, on May 21, ISS will acquire a four-frame mosaic of Titan's anti-Saturn hemisphere from a distance of 585,000 kilometers (364,000 miles). Combined with the data acquired riding along with CIRS during the flyby the day before and single frame observations taken over the next two days, this sequence will be used to track cloud movement across Titan as well as assess the change in Titan's weather pattern with the onset of northern spring and southern autumn. Two additional observations will wrap up Rev131. On May 22, ISS will image Iapetus and its surrounding space to search for dust in the moon's hill sphere, the region of space where Iapetus' gravitational pull dominates over Saturn's. In-falling dust from Saturn's small outer satellites is thought to have been the catalyst of the dark terrain region on Iapetus. Finally, on May 23, ISS will conduct a calibration of its cameras photometric response by imaging the star Vega using all of its filters in both cameras. On May 26, Cassini will reach apoapse on this orbit, bringing it to a close and starting Rev132. During Rev132, Cassini will fly by Titan once again as well as perform a pair of close, non-targeted encounters with Rhea and Tethys. vu de plus pret : Daphnis (dim. 9 km ) et toujours ces incroyables onde de gravité. représentation en fausses couleurs : pourpre > 5cm, vert < 5 cm et bleu < 1cm. Premières vues (22 au total) rapprochées (à 36125 km, le 16 oct.) du satellite PALLENE, découvert en 2004 par Cassini et dont la taille moyenne n'excède pas la moitié de celle de Deimos soit environ 5 km ! Il orbite entre Mimas et Encelade. 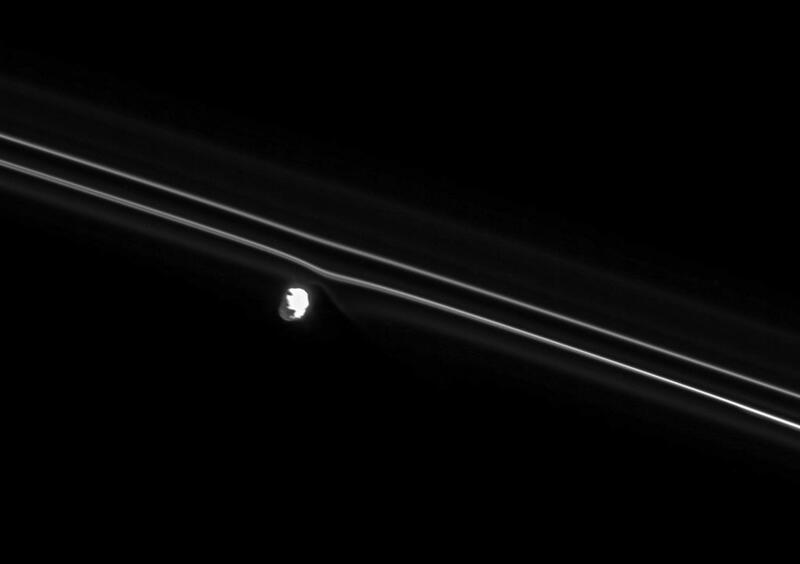 Etonnement, sur ces images (en transit devant Saturne), son aspect apparaît extrèmement régulier voire sphérique, du moins vu sous cet angle ce qui semble surprenant (et unique ?) pour un monde de cette dimension ! "I'm pretty shocked at how spherical the thing looks." 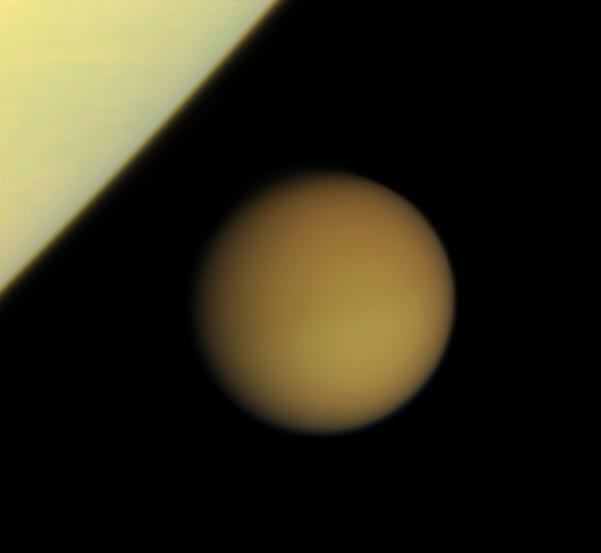 ne très belle images de Titan en contre jour. 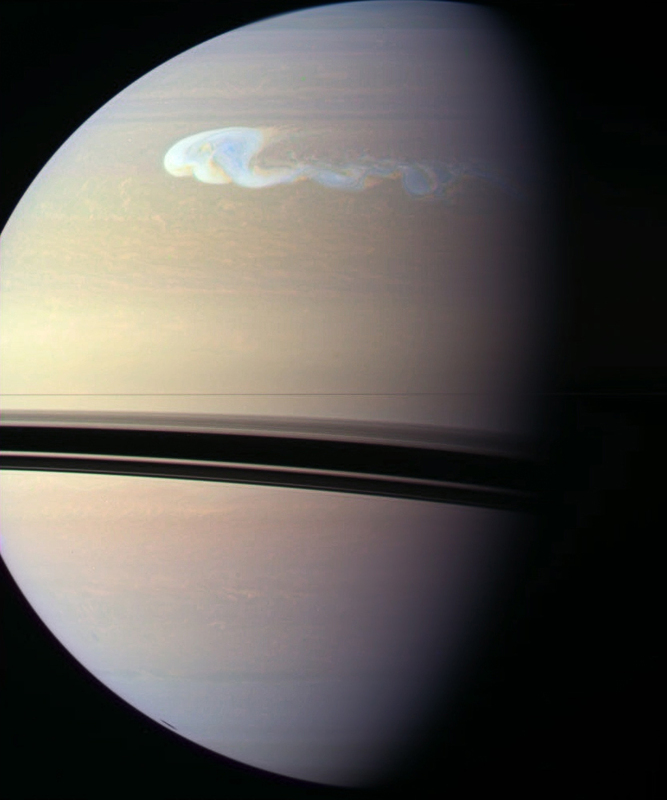 Le 30 novembre 2010, après avoir visité Hypérion, la sonde Cassini a survolé Encelade, le petit satellite de Saturne qui étonne les scientifiques par ses geysers actifs. Peu après son passage à seulement 42 km de la surface glacée de la lune saturnienne (passage dont on n'a pour l'instant qu'une image), la sonde a pris cette vue. Depuis une distance de 66000 km, les caméras de Cassini révèlent les jets d'eau et de poussière qui s'élèvent de fractures qui zèbrent le pôle sud d'Encelade. Les fines particules de ces panaches qui s'étendent dans l'espace sont rendues brillantes par rétrodiffusion de la lumière solaire. 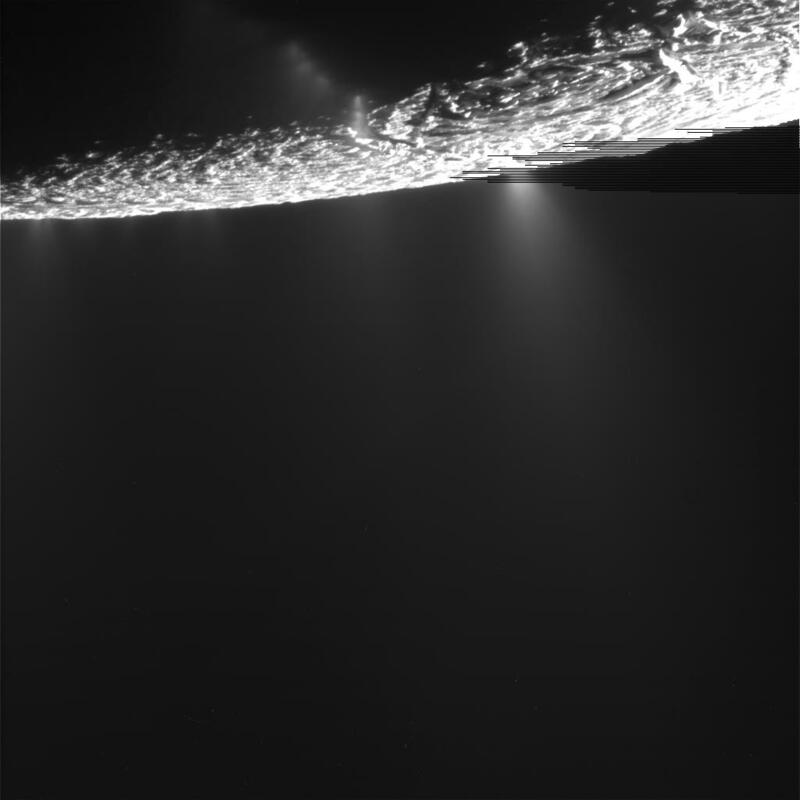 La surface d'Encelade -plongée dans la nuit-, est quant-à elle partiellement éclairée par un « clair de Saturne ». La planète géante se trouverait sur la droite si le champ était beaucoup plus large. 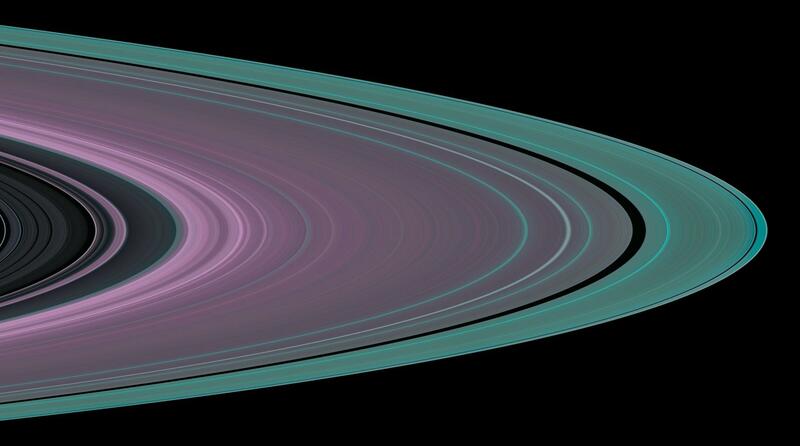 Cette image a été mise en couleurs par notre journaliste Jean-Luc Dauvergne, à partir de trois clichés monochromes de Cassini pris dans le vert, le bleu et l'infrarouge. Philippe Henarejos, le 2 décembre 2010. Remise de son avarie, la sonde Cassini a survolé Hypérion le 28 novembre 2010. Cette vue en fausses couleurs a été prise à 72 451 km du satellite de Saturne, à travers des filtres infrarouge, vert et ultraviolet. En réalité, Hypérion est gris comme la Lune. Nous avons ici accentué ses teintes afin de mettre en évidence les variations de terrain de sa surface. Composé essentiellement de glace, Hypérion est aussi le plus gros objet du Système solaire à avoir une forme irrégulière. Serait-il issu d'une collision ? En 2005, Cassini en avait réalisé des vues plus détaillées. Elles sont visibles sur le site de NASA. Nous attendons sous peu les images du survol d'Encelade réalisées dans la foulée le 30 novembre 2010. La sonde est passée à seulement 48 km du satellite ! toujours le même avec une frontière entre un vieux terrain et un "neuf"
étroite d'absorption du méthane permettant un sondage vertical (rasant ici) de l'atmosphère. À près de 60 000 km de distance, la sonde Cassini a une nouvelle fois scruté la surface du satellite Rhéa en détail, le 11 janvier 2011. Au passage, elle a saisi les anneaux de Saturne, avec Dioné, un autre satellite de la planète, à l'arrière-plan. En découle une scène en profondeur, avec trois plans situés à des distances très différentes. Les satellites se livrent souvent à ce genre de ballet sous l'œil de Cassini, comme le montre ce passage de Dioné devant Titan, ou encore celui de Dioné devant Téthys le 26 janvier 2010. Le "dragon" de la zone Nord est toujours vivant et Cassini le 26 février dernier nous en a détaillé l'aspect avec sa caméra petit angle depuis environ 2,4-2,5 millions de km ... La direction Nord est à gauche. En fait, la "tête" du dragon est à contre-courant du mouvement de rotation général de l'atmosphère !